We have a secure facility for sending credit card details when ordering. Once details are received we will confirm via email. You can search our entire stock here for a specific book, via Author or Title or search by subject on our homepage. Once a desired book is found, click on 'ORDER'. If you wish to continue viewing books, click the 'Search again' between the 'Proceed with order' and 'Cancel order' button. You will return to the list you were viewing or the Search page.To continue adding books to your order simply click 'ORDER' on the next book you want. When you have finished viewing or searching click on 'View shopping cart', at the far right of the page. To remove any unwanted books from the shopping cart simply click 'Remove the item'. When satisfied with your order click 'Proceed with order' . Follow the prompts, this takes you to the secure ordering page. Overseas customers may make payment by Visa or Mastercard, giving full details or bank cheque in Australian dollars. Purchases within Australia may be made by Mastercard, Visa, cheque or direct bank transfer. Email for our bank details. We do not accept American Express even though it shows in the drop box, apologies for any inconvenience. Shipping and postage is an additional cost. For overseas customers books will be shipped via air unless otherwise requested. This normally takes 4-10 days to arrive. Insurance is an additional cost. Postage within Australia parcels standard postage charge by weight plus $2.20 for packaging box. . Your books will be securely packaged in a premade box specific for books, in this way we know that your book(s) arrive in the same condition as they leaves us. 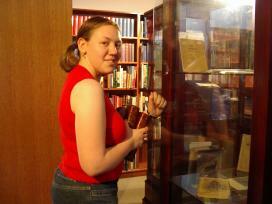 Alice, finding books for customers.